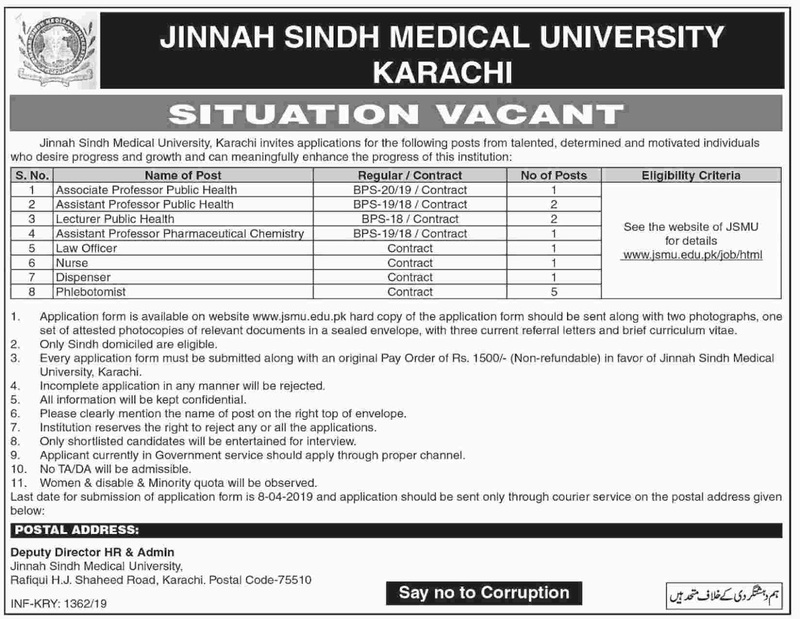 Jinnah Sindh Medical University JSMU Karachi is offering multiple new vacancies on contract basis. Currently, the applications are being invited for the following posts which include; Associate Professor Public Health, Assistant Professor Public Health, Lecturer Public Health, Assistant Professor Pharmaceutical Chemistry, Law Officer, Nurse, Dispenser, & Phlebotomist. Only those candidates who live in Karachi city can apply for these jobs & this is a great opportunity for Karachi students. Candidate must have domicile of Sindh are eligible to apply. Attractive salary package will be given to the applicants. Let's have a look at its applying conditions below. 30 to 50 years is age limit required for Karachi University? Ph.D., M.Phil. Masters and Bachelors with relevant several years’ skill are needed to hold these posts. How to Apply for JSMU Karachi jobs in March 2019? 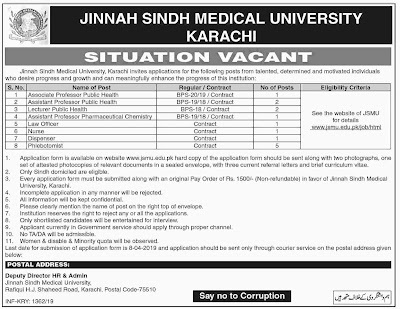 Interested applicants are required to send the application form along with attested copies of educational certificates, & experience certificates in a taped up the envelope with three current reference letters and CV should reach at the given address; The Advisor Human Resource Jinnah Sindh Medical University, Rafiqui H.J. Shaheed Road, Karachi.  Candidates can download Application Form from the official website; www.jsmu.edu.pk.  Candidates must have to attach with an application pay order of Rs. 1500/- in the name of JSMU (Jinnah Sindh medical university Karachi).  Applicant currently in Government services should apply through proper channel.  Only shortlisted candidates will be entertained for an interview.  Candidates should bring all original documents at the time of interview.  No TA/DA will be funded to any candidate for appearing in Test / Interview.